You have probably noticed that I haven’t posted any recent updates on the Shelbyville organ. There’s a reason for this: I’ve been to busy actually BUILDING the Shelbyville organ. Once it is finished, I will catch you up on the subjects I haven’t had time to cover. 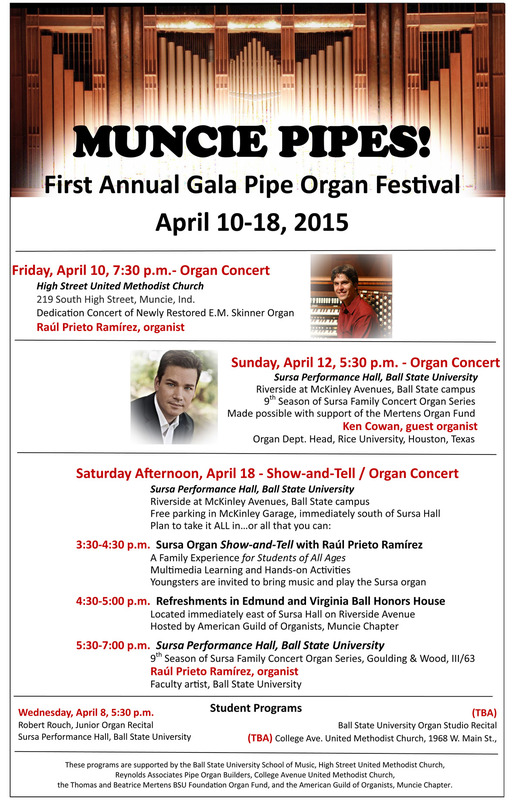 Meanwhile, the Muncie chapter of the American Guild of Organists is having a Muncie Pipe Organ Festival in April, with several really spectacular events, including the inaugural concert of the recently restored and expanded E. M. Skinner pipe organ at High Street UMC in Muncie, IN. Raul Prieto Ramirez will play this 4-manual, 70 rank organ on Friday evening, April 10, at 7:30. Only two days later, our good friend, Ken Cowan, another magnificent young (well, by my standards, anyway) organ virtuoso, will play the Sursa Hall organ at Ball State University. Then, on Saturday, April 18, there will be a family day at Ball State, featuring the Sursa organ, ending with an early evening (5:30) concert by Raul Prieto Ramirez. This is a new project by the Muncie AGO, and the first of many new outreach programs by Ball State University and High Street United Methodist Church!